It’s fairly safe to assume that many of you reading this are musicians, and that a fair percentage love the rush of hitting the stage. Those who have ventured beyond the local pub and club scene will also have experienced many of the ups and downs of touring life. It’s a tricky skill to master, and involves a lot of planning and organisation to get it right. With the rising importance in live music for the industry in general, it seems sensible to dig deeper into what this means for underground artists. Is it a way to recover losses from the reported drop in recorded music sales? Is it an effective means of promoting your music? UP: So, you just came of a string of live dates in Scotland and Northern England, right? Scott Anderson: We’re in the middle of them. Got a couple more down south over the next couple of weeks and we’re done. UP: How did you fare? Was there decent attendance at all the shows? SA: A couple of reasons – one is that we played Glasgow about 6 months ago with Watain, so we don’t want to overplay just because it’s close to us. The other is that, in general, the central belt (especially Glasgow) has been seeing really low attendances at gigs recently. I think that’s probably a combination of financial climate and over-saturation. There are so many gigs happening in the area that they’re competing for audience. From our point of view, we’d rather do one great show every year or so than a few shows where people in general say “I saw them last month” or “I’m sure they’ll play again soon” and then we’re just another show competing for audience share. UP: You mentioned briefly that one of the gigs was a bit last minute and didn’t end up on your tour poster (thereby affecting attendance). Different people have their own theories on reasons for low attendance: bands blame lazy promoters, who in turn blame bands for not helping to raise awareness. Do you think there’s any particular direction to throw the blame? Should bands be taking more involved approach? SA: With this particular gig, I don’t think there’s any blame to be cast. It was a great little gig and the promoter knew it was too late for us to do much promoting. We were purely there to play to the folks that would otherwise have had a gap in the lineup. In general, though, I do have a theory and that’s that it’s everyone’s fault. Aside from the fact that the [art] of “in person” publicity is unheard of to some people and that there are always things everyone could be doing better, there’s a more fundamental reason. I think there are too many gigs and that’s because there are too many bands, many of whom are out playing gigs before they are ready to. And promoters are putting them on. Why is that a problem? Well, your average fan thinks “I want to do that. I CAN do that!” then starts spending their money on music equipment rather than on going to gigs. Great, nothing wrong with that – that’s how we get excellent new bands. But, now there are promoters that don’t have a financial stake in whether the band brings a crowd (because they’re not paying the band) and they put on all these unready bands with little to no quality control. There are now fewer fans and more gigs. Not only that, but the general standard of gigs is lowered. So people go to fewer gigs – they don’t want to spend their money to hear some derivative, badly played noise. If promoters made a point of paying bands no matter what, they’d only book those bands that they’re sure of. Under-par bands would have trouble finding gigs until they improve (this is where we miss the old pub circuit in Scotland) and attendances would rise (hopefully). UP: It’s an interesting theory, but would it ever work? I mean, are hopefuls going to only do shows when they’re ready, and will promoters only put on bands they have to pay? Maybe what we’re talking about here is a socially established, two way quality control, where bands are responsible for even more in terms of who they chose to work with. SA: Don’t really see it. It would mean everyone sticking to the idea. Also, we don’t have the pub circuit that we used to – the local pubs willing to bung upcoming bands a few quid or some beers to play, with no cover charge. Without that, it makes it hard for the hopefuls to learn stagecraft other than diving straight into “proper” gigging. Promoters should be paying every band – the band are providing a service from which the promoter hopes to benefit financially. Problem is, with the lack of those pub gigs, there are promoters starting up who don’t want to make money but see themselves as doing the bands a favour (which, for the start-ups, they are), so don’t pay. I don’t think they see that is self-defeating and they’ll only get mates of the bands showing up. Two-way quality control is a good way to put it, but I don’t know how that would work. I’m not a fan of hounding people because they don’t do things my way. These bands NEED somewhere to either improve or to find out they’re better off and happier just as fans, so these promoters are the current solution; the industry needs new bands. New GOOD bands. It just seems at the moment, people are encouraged to start bands and thrown straight into one level of activity and almost actively prevented from progressing by virtue of this very same mechanism applying to everyone regardless of merit. Maybe if bands were given some kind of “career pathway” training, and promoters had to adhere to a voluntary code of conduct, that would begin to fix the problem. But then, who would provide the training and who would enforce the code? I don’t have the answers, but there must be some. We weren’t always in this situation. UP: Okay, let’s talk live vs recorded: You’ve just put out an EP, The White Death – how is that doing compared to the live campaign? UP: So would you say that, for Achren at least, the old model of live shows driving recorded sales is still the way to go? SA: I would say so. Although it would be foolish to rely on that alone. Once the tour is over, we’ll keep up the campaign in other ways – magazine appearances, online ads, anything that we can think of. In my line of work, I meet a lot of people who present me with opportunities to publicise our release (even just to a few people in another country, for example) and I meet a lot of people who are themselves interested in buying our music. So I incorporate my band into my everyday activities, making a few sales here and there but also laying the groundwork and making connections for future live campaigns or targeted marketing online. Sometimes this results in one of the band visiting the place in question and selling recordings to the local independent record shop. The band acting as its own record label allows a lot of flexibility in this situation! UP: For those who don’t know, what’s your ‘day job’? SA: I’m a stage manager at festivals, a guitar tech and general stage crew guy, depending on what’s required. Effectively, I spend my working time at most of the major UK festivals and am in contact with bands, crew (who are usually huge music fans, funnily enough) and all sorts of music-loving people every day I’m at work. SA: Definitely! Without ramming your band down anyone’s throat, if you’re not confident enough in your output to bring it up in conversation about music, why should anyone else take a punt on listening to it? Everything that is done is done by a person and people try to do things that they enjoy. If you can put yourself in a position where everyone around you is working with music and you’re happy to talk about your band, opportunities just pop up over and over again. I understand my line of work is a bit specialised, but working in a record shop, a guitar shop, as a piano teacher – these are all in the same category: jobs where you’re more likely to find people willing to help your music career (even if it is just buying a CD). Also – giving away band shirts isn’t always the best idea but, if you are going to give one away, don’t give them to people who would have bought one, give them to people who work with music and whose opinions are respected. Give them to stage crew, record shop owners, stage managers. UP: Okay, a couple more questions: What would you say is the biggest issue for bands trying to live ‘live’ underground? SA: I’d say the biggest issue getting fans to come to your out of town shows. Hometown shows, you live there, you can decide when to play, how often is too often. You can build up a local buzz before your shows. Out of town gigs, often you don’t know the local scene, you can’t get on the streets and talk to people, you’re committed once the tour is booked; that date is the only date you have free between the other shows – you can’t shift it to just after payday, for example. You have to rely on the promoter to know this and do all the legwork. Boils down to: you need to find like-minded promoters you can trust in other cities. UP: Great stuff, Scott! Thank you for taking part! I hope you have the best of luck with the rest of the tour and the continuing campaign for The White Death! To wrap up, do you have any last nuggets of advice for underground bands who are planning to hit the circuit? SA: Cheers! No problem, man! I would say make sure you’ve honed your show (not just your set) to a fine point before doing a few local gigs. Once you’ve done that, look out for every opportunity to play further afield but think VERY carefully before doing a gig that costs you more to get there than you’ll get out of it (if the promoter can’t give you a guarantee, how many paying punters is he expecting – remember you can play to 5 people for free at home). And finally, don’t overplay any one place. Well, that appears to be contradictory, but I’m sure you know what I mean. See you soon, fella! 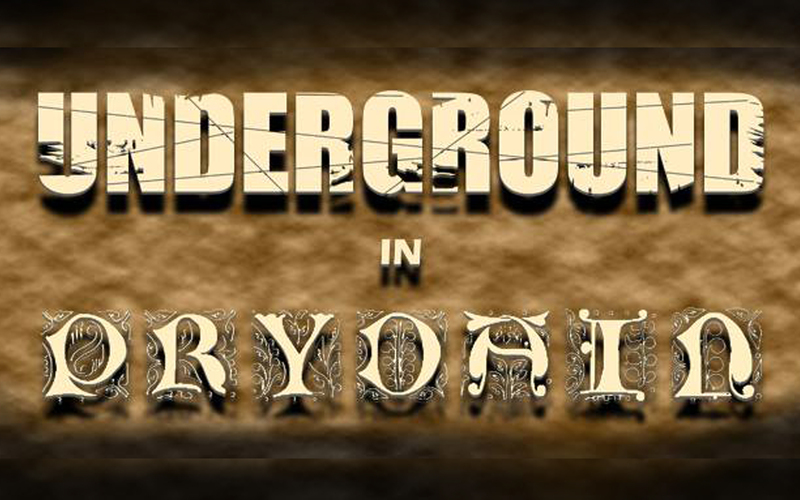 ← Can we live ‘live’ underground?